The Ancient Order of Hibernians have a long and storied history of protecting, serving, and aiding those in need. They have continuously served others from it’s humble start in Ireland to it’s beginnings in America. Today the AOH in Louisville supports local communities, those in need, and the City in General. In doing so the AOH also takes the time to honor those that also do so in accordance with the AOH motto of Friendship, Unity and Christian Charity. In this vain we now honor those that rush in when others run away, those that step into chaos as others retreat, and those that save others without regard to anything other than service and honor. 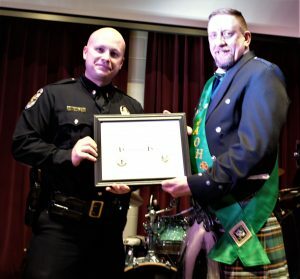 We proudly present the Hibernian Hero Award yearly to the LMPD, Sheriff, LFD, and EMS person of the year. We honor the first responders that allow us to do what we do by being on call for all. Major Eric Johnson accepts the posthumous award for fallen hero Officer Nicholas Rodman. The married father of two comes from a family of police officers. His father, George, works in the department’s training division and his brother, Andy, also serves on the force. By all accounts Officer Rodman was devoted to his family. He learned to be a leader from his father and how to be patient and kind from his mother. He is said to have been best friends with his brother Andy and was a protector of his sister Carly. If you need to know how important his family is then all you need to know is that Sunday dinners were all about family. He knew the important place he needed to be each week. Officer Rodman had served with the Louisville Metro Police Department for three years. Officer Rodman gave all he had in life to those he cared about and that includes all of us, the people of Louisville. Officer Rodman is survived by his wife, Ashley, son, Mason, and daughter, Ellie. “Nick is a hero. He will never be forgotten” were the words of Chief Steve Conrad and they ring true today. LFD Michael R. Bryan, Jr.
Captain Bryan has been a Louisville Firefighter since March of 1999, currently serving the City of Louisville’s Clifton Neighborhood. He is a leader and a true public servant, deeply invested in the community; for the past six years he has volunteered his time fundraising for the Home of the Innocents. His leadership and initiatives yield a yearly average of $25,000 for the Home. Captain Bryan’s service for his fellow man predates his time as a Louisville Firefighter; having joined the United States Navy as a teenager, his decorated thirty-year military career, ten years of active duty and twenty years as a Reservist; saw him serve our country proudly and honorably. For his dedication to serving his fellow man, the Louisville Division of Fire proudly nominates him for the Hibernian Hero honor. Sgt. Rarden started her career as an EMT with Jefferson County EMS on July 10th 2002. She has been a dedicated member serving the sick and injured in public in our community. Sgt. Rarden not only commits her time to helping others who have called for assistance she routinely is the first to step up to assist fellow co-workers who may find themselves in need. She leads the way in fundraisers for personnel who are faced with serious family illnesses or are unable to work due to illnesses of their own. One of our own face his battle with cancer to ultimately succumb to the disease. She and others helped to make it possible for him not only to be off work and meet his financial obligations, they went above and beyond so that he could take a vacation with his family before his disease made travel impossible. It is with this same determination and compassion that each and every Thanksgiving and Christmas Angie coordinates an employee dinner, making sure personnel know what is needed, when to bring in items and she sets up the meal keeping it hot so that those who have to work on a holiday have the opportunity those days to enjoy a wonderful holiday meal. Volunteered countless hours to the Louisville Metro EMS honor guard providing not only comfort but honoring those who have served EMS. She manages the EMS flower fund that employees contribute to so that a small gesture can be sent on behalf of the employees to individuals. Upon retirement Sgt. Rarden ensures that those individuals are in receipt of a plaque in recognition of their years of service. Recently we had the opportunity to watch Sgt. Rarden at work. LMEMS received a call for an injury accident involving multiple loaded school buses, Angie was on the first arriving unit to the scene and rapidly set up an incident command system and coordinated obtaining the correct amount of resources and accounting for the injured children making sure we knew who they were, what their injuries were and which hospital they were being transported to. While this seems like a simple task, it is only compounded by the anxious parents who arrive on scene worried about their son or daughter. throughout the incident. He initiated radio contact with base but did not wait for backup as there was an immediate threat. numerous pocket knives and a set of brass knuckles off the other suspect. The third subject turned out to be the victim of the home invasion. When responding units began to arrive the residence was checked and two more individuals were found and the two suspects were taken into custody. 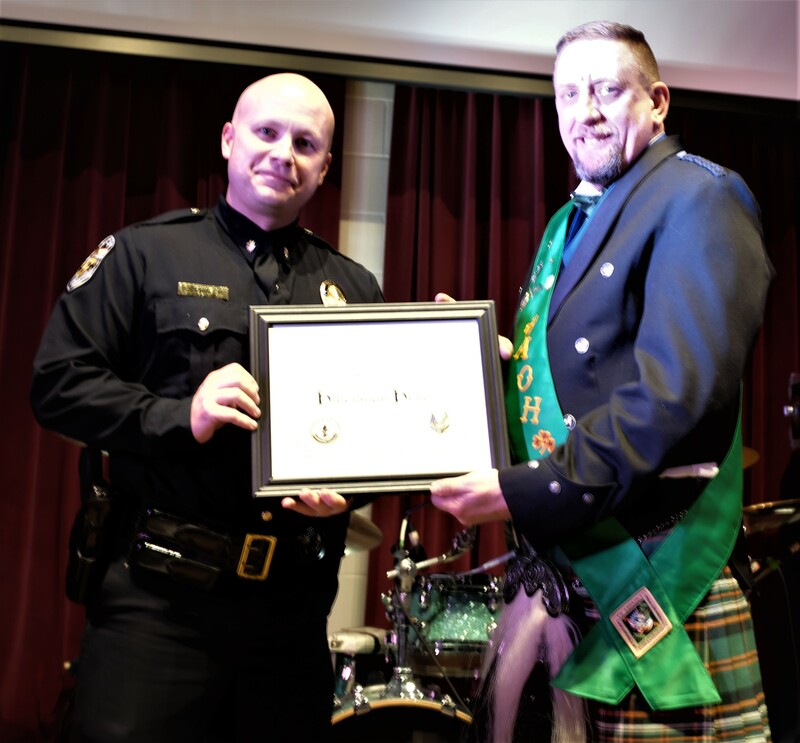 Through his bravery, he likely saved the life of the victim of the home invasion, making him a true Hibernian Hero! 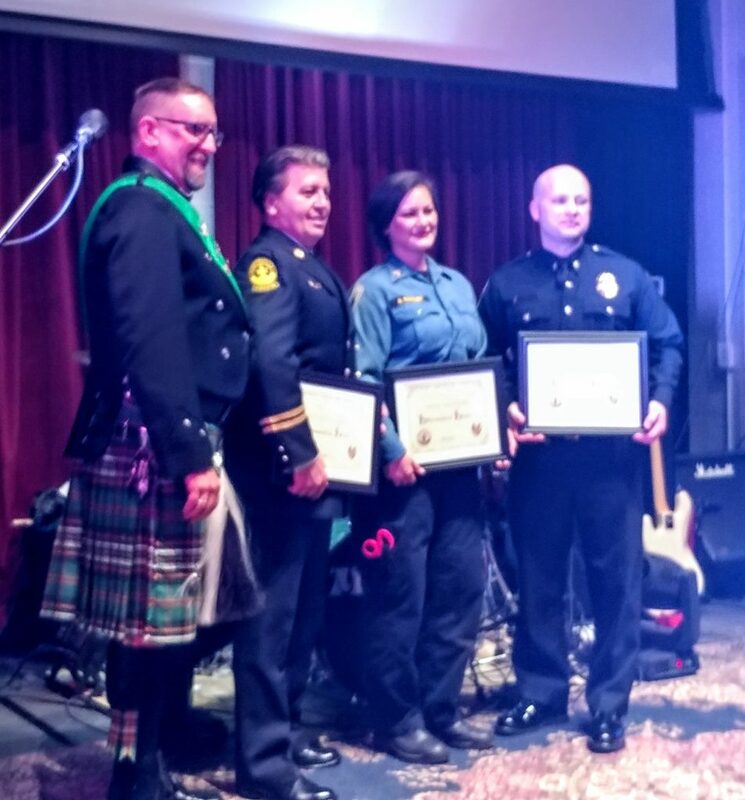 AOH President John O’Dwyer, LMPD Major Eric Johnson, EMS Angela Rarden, and LFD Captain Michael R. Bryan, Jr. on stage with the Hibernian Hero Awards.